Série Silver Bug de 2 onces | Ronde d'argent Longicorne géant à haut relief Order your 2 oz Silver Bug Giant Longhorn Beetle silver round from our online shop today for the best price on the web. Inspired by Reddit's Silverbug community of online silver enthusiasts, the Silver Bug series, of which this round is the 4th edition, has been met with wide acclaim. The wholly striking obverse feature is Macrodontia Cervicornis, best known as the Giant Longhorn Beetle, artfully captured on a field of starburst radial lines. 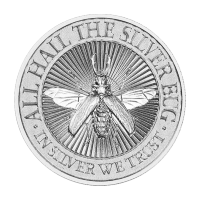 Also on the obverse, a wide frame with its own point textured field, in which you'll find the cheeky slogans, 'All Hail The Silver Bug' and 'In Silver We Trust.' The rounds reverse features the Intaglio Mint's stately logo within it's own, smaller star burst field and a stipend border, all realized with dazzling effect. Within the reverse' outermost frame, details of content, weight and purity. This species of beetle is one of the largest known specimens on the planet, with males reaching up to 14cm length, notincluding their 'antlers'. Satisfy your collector's spirit and your entomological interests at once by enhancing your portfolio with a 2 oz Silver Bug Giant Longhorn Beetle silver round today.